If you are watching current trends in strength and conditioning, you can witness the revival of many old school tools and methods. Trial and error period of bodybuilding and machines is thanks God finally over, and many people (martial artists included) are coming back to simple tools like bodyweight exercises, barbells, and – kettlebells. Especially kettlebells are one of the most useful and versatile tools in martial artist’s toolbox. Nothing new under the sun – Chinese martial artist use similar tools and exercises for centuries. 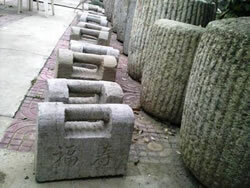 So called „Stone Locks” (or “Stone Padlocks“, in Cantonese Sek So) are a special type of dumbell in a shape of old Chinese padlock, hence the name. The earliest records of the practicing with stone locks are from the Northern Sung Dynasty; they were also very popular especially in the Ming and Ching dynasty. We see them today in many Northern and Southern Shaolin based systems and in Chinese-Mongolian Wrestling. The picture of Sek So on the left was taken during my visit of Henan Shaolin Monastery in 2004. 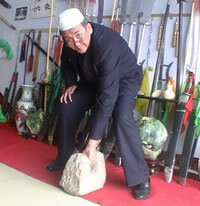 Smaller “Stone Locks” (or “Iron Locks”) are used in the training regimen of Fujian White Crane (Fuk Gin Baak Hok). Japanese styles which originate from the White Crane, like Gojuryu Karate are used similar tools as well (Ishi Sashi, Tetsu Sashi). Lighter Sek So are usually used in pairs – the exercises mimic the offensive and defensive techniques of the particular system. Bigger and heavier Stone Locks are used sing to practice various ballistic drills like Swings, Snatches, bottom up Cleans etc. Sek So are also juggled, rotated in the air, passed over back or under the legg and passed form hand to hand, or thrown and catched in the partner exercise. Sek So or similar tools develop full body explosive power, strong posterior chain, hand to hand coordination, strong grip and cardio from hell. See a short documentary from a Chinese TV below (with English subtitles; thanks to Nick Domich for the link). Apart from teaching Hung Kyun, I am also a StrongFirst Certified Instructor. Our Chinese martial arts school was one of the first Hung Ga Kyun schools to use systematic strength & conditioning training with kettlebells, which are in my opinion not only more available than Stone Locks, but also more versatile. Your sparring partners will notice in no time, that’s for sure. This entry was posted in Hung Kyun Curriculum, Hung Kyun Videos on April 23, 2014 by Pavel Macek.